Cape Town isn’t a huge city, as big cities go, but there’s more to see and do than you could fit into two years, never mind two days. It’s a delicate balance. You want to leave feeling like you’ve managed to get under the skin of the city, but you don’t want to be in a rush for the full time you’re here. Two days in Cape Town requires planning, structure, and local insight. Thankfully, we’ve got all that down for you. Take a look at our two-day Cape Town whirlwind adventure, and rest assured that you’ll get the most out of this gorgeous city in just 48 hours. Cape Town’s City Bowl is its lifeblood. This is where the action is, from museums and art galleries to bars and restaurants. Cape Town is also quite unique in that there are spectacular beaches, forests, and mountains surrounding the inner city itself, so you’re never too far from somewhere amazing. Start at the V&A Waterfront, which is basically a neighbourhood in its own right. You can grab some breakfast at any of the incredible restaurants and cafes here, but don’t get too distracted—there’ll be time to check the Waterfront out properly later. For now, head for the City Sightseeing bus stop. There is genuinely no better way to see Cape Town than by enjoying the scenery from the top level of the open-top bus. Pro-tip: it’s also worth getting your hands on a Cape Town City Pass, which will get you free entry to over 70 attractions, many of which are on the route. We’d recommend taking the Red route, which takes about an hour and a half if you just sit back and enjoy the ride. Allow most of the day for it though, because you’ll want to stop off at some of the amazing attractions en route! Start with Table Mountain, where you can take the cable car to the top and take advantage of the 360º views to survey the incredible city you’re about to explore. From here, the bus takes you over the mountain to the Altantic Seaboard, where you’ll be able to visit the gorgeous sandy beaches of Camps Bay and Clifton. 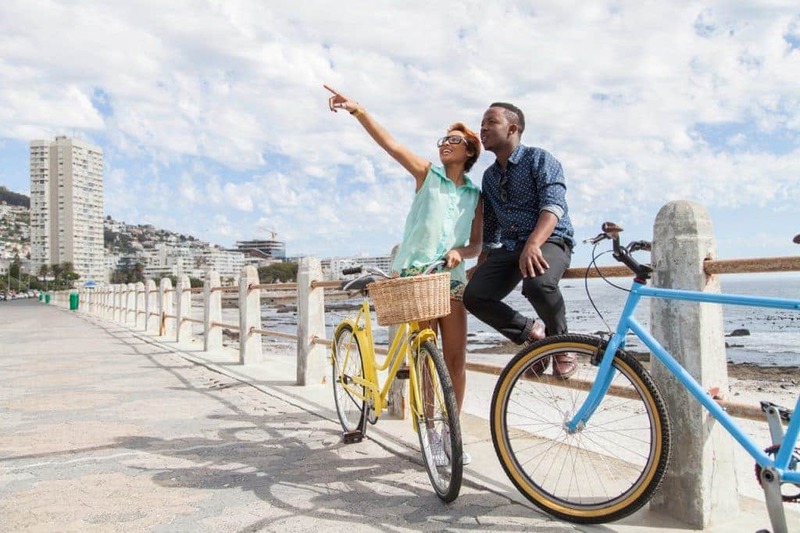 If the weather is good, hop off at Sea Point and take a stroll (or rent a bike and cycle) along the Sea Point Promenade to the next stop. When you arrive back at the Waterfront, spend a few hours here. Do some shopping, take a spin on the Cape Wheel, or marvel at the diversity of our marine life at the Two Oceans Aquarium. As sunset approaches, head to one of the incredible bars overlooking the ocean, and order a bottle of local wine to enjoy with the views. Your dinner options are endless, too. There are hundreds of choices at the Waterfront or in the city, ranging from fine dining to casual burgers or pizzas. Once you’re well fed, head to the City Bowl (and Long Street in particular) for live music, cocktails, dancing, or a night cap. If you’re ahead of schedule, there’s alos some amazing shopping to be done here by day. Sit at a pavement table to people watch, but remember to hold onto your valuables, or keep them out of sight. Day 1 will have showed you a few of the big attractions around the city and Atlantic Seaboard, so day 2 is about the other side of town. We’d recommend hiring a car or finding a tour operator to tailor a tour for your group, and heading south. Take a scenic drive along Victoria Road and then over Chapman’s Peak. This will get you to Hout Bay, where you can spend some time at the beach, and enjoy some of the best scenery in town. From here, it’s worth taking the trip to Cape Point if you’re still doing well for time. It’s one of the most beautiful promontories on the planet, where towering cliffs rise above the tumultuous seas, and the views are truly endless. Next, we’re heading to False Bay. As you continue back towards the city from Cape Point, the best suburb you’ll reach is Simon’s Town, where Boulders Beach is located. This is the home of the African Penguin colony, where you can get up close and personal with these adorable critters, and cool off in the sheltered swimming beach. 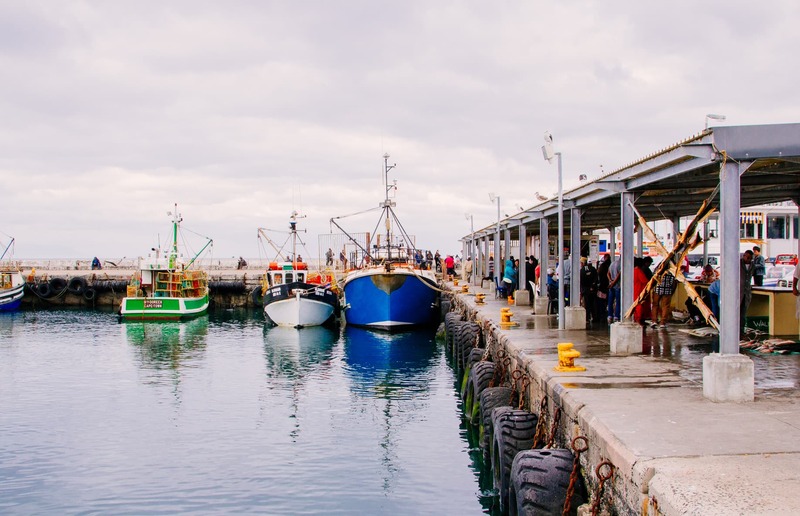 The next stop is in Kalk Bay to enjoy the quirky curio vendors, antique shops, and clothing boutiques. This is also where you’ll find some of the best seafood in town, from the delicate flavours at Harbour House to the cheap-and-cheerful fish ‘n Chips at Kalky’s. You can’t go wrong with seafood in these parts, and the colourful fishing boats that line the harbour make from some fantastic photographs. Between the boats, Cape fur seals dart through the water, while on the docks fishermen unload their catch for the day. It’s a quintessentially Cape Town scene. As you make your way back towards town, consider a stop in Kirstenbosch, the first botanical garden in the world to be established (in 1913) to protect local flora. Its lawns are ideal for picnics and there are several walking trails. You can spend the rest of the afternoon here, and maybe even stop off for a quick wine-tasting in Constantia if it’s before 4 pm. Constantia is also home to some of the country’s best fine-dining restaurants, if that’ your cup of tea. Just make sure you book long in advance. Otherwise, take a look at our neighbourhood guides to find a good restaurant close to where you’re staying. Take a look at the pics other have shared and share your own using #lovecapetown!